We’re bringing together two fun activities for a weekly great time! 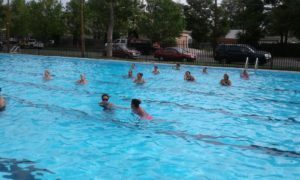 Meet us at the Glenarm Recreation Center for FREE Aqua Zumba in the pool. With a combination of energetic Zumba, lively music, and the indoor community pool, our Aqua Zumba classes are sure to be a good time for everyone! For more information, contact Sandy Douglas at 720 621-4912 or email Sandy@GroundworkColorado.org.